Introduction: Adjustable gastric banding is one option for obese patients pursuing bariatric surgery, though not all insurance policies cover the procedure. Patients may pay out of pocket for bariatric procedures if they do not have insurance that covers the operation. There may be a difference in expectations and motivation between these two patient populations may leads to a difference in outcomes. Self-pay patients may have more motivation to lose weight due to the significant financial investment. Methods: Data was collected prospectively in a bariatric surgery database for all patients undergoing adjustable gastric banding at our institution. Excess weight loss was then compared at our institution at 6 months (n=83) and 1 year (n=41) using a paired student t-test. Minors were excluded from data analysis. Results: Age, gender, and ideal body weight were identical between groups. Actual body weight was higher in the insured group (262 lbs vs. 248 lbs). At one year follow-up, excess weight loss was 50.63% (range 26-79) for the insurance group versus 43.68% (range 12-78) for the self-pay group though this difference was not significant (p=0.12). 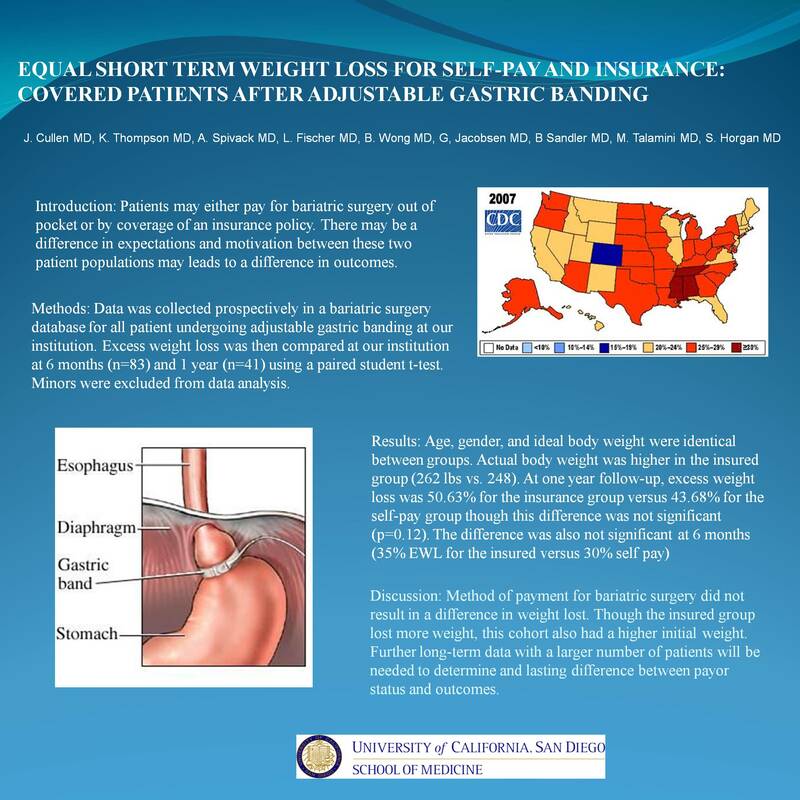 The difference was also not significant at 6 months (35% excess weight loss for the insured versus 30% self pay) Discussion: Method of payment for bariatric surgery did not result in a significant difference in short term weight loss following adjustable gastric banding. Though the insured group lost more weight, this group also had a higher initial weight. Further long-term data with a larger number of patients will be needed to determine if any significant difference between insurance coverage and outcomes.